Washington, Jan 23 (Just News): Reports of chlorine gas being used against innocent civilians in Eastern Ghouta by the Syrian regime are yet another demonstration of its blatant disregard for international law and cruel indifference for the lives of its own people. In November, Russia vetoed the renewal of the Joint Investigative Mechanism (JIM), the independent, impartial, technical group unanimously created by the UN Security Council to investigate the perpetrators of chemical weapons attacks in Syria and identify those responsible. “When Russia killed the JIM, they sent a dangerous message to the world – one that not only said chemical weapons use is acceptable but also that those who use chemical weapons don’t need to be identified or held accountable. If these reports are true, this attack in Syria should weigh heavily on their conscience. 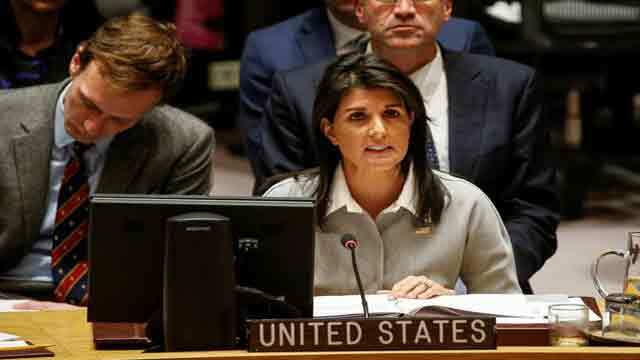 The United States will never stop fighting for the innocent Syrian children, women, and men who have become victims of their own government and those who continue to prop it up,” said Ambassador Haley. The United States will pursue all available avenues for accountability, including through the UN Security Council, the Organization for the Prohibition of Chemical Weapons (OPCW), the Commission of Inquiry (COI) on Syria, the International, Impartial, and Independent Mechanism for Syria (IIIM), and the International Partnership Against Impunity for the Use of Chemical Weapons.